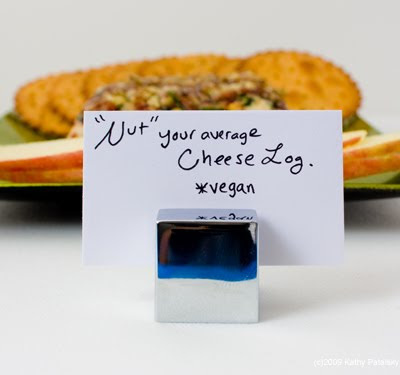 Vegan Appetizer: Nut Your Average Cheese Log! Remember those paperweight-heavy, waxy, nut-slathered logs of cheese? They always seem to pop up at an office holiday party or in those holiday gift basket catalogues. You can easily spot that electric orange cheese log from across a crowded room, the creamy filling spilling out of its crumbly brown nut coating, dancing with a ring of cracker rounds brimming a silver (or plastic) serving platter. They are so 80's. But wait, aren't the 80's 'in' right now? Really, who doesn't love a cheese log?! 1. Grab your 'mold' dish. Just make sure that it has a large flat surface area on the top and bottoms so that you can properly season the dish before pouring in the cheese. I used a more angular rather than round dish, but it worked out well. 2. 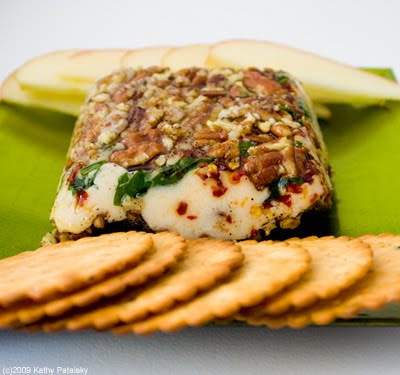 Crush you pecans, chop your parsley and tear your cheese into rough chunks. 3. Prepare your cheese mold dish. Wipe the inside surface with olive oil and drizzle a bit of olive oil in the bottom of the dish. Add a hefty layer of pecans and half your parsley. Sprinkle a bit of salt and pepper int he bottom as well. Sprinkle half your red pepper flakes. Set aside. 4. 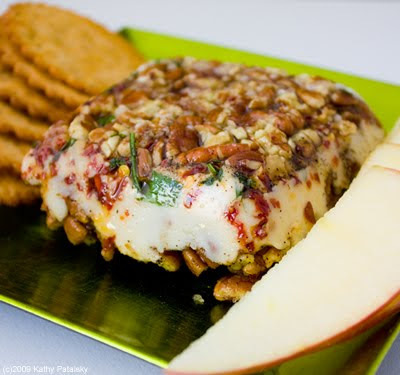 Using a separate small container you will be melting the cheese. Spray this dish with oil spray so the the melted cheese easily slides out. Microwave on high for about 1 minute - or until the cheese bubbles and is fully liquid. 5. 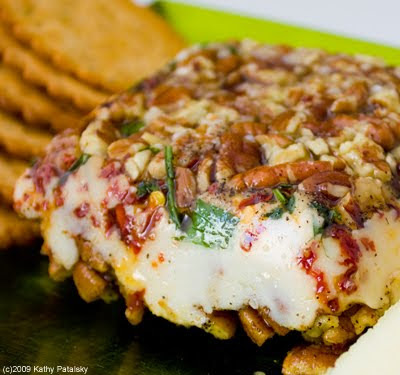 Immediately pour the melted cheese into your mold dish - right on top of the pecans/parsley/pepper. 6. Next, cover the top of the melted cheese with your remaining topping ingredients. The pecans, parsley, red pepper, black pepper and salt. Lastly, drizzle your maple syrup, orange juice and remaining olive oil right on top and around the inside brim of the dish. 7. Fully harden in fridge. Cover your dish with foil and place in the fridge for at least 2 hours or overnight if needed. Note: a shallow dish with a thinner 'log' will harden faster than a dense thick log. 8. 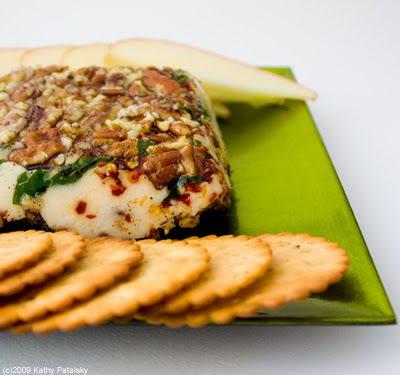 Serve with crackers, sliced apples, flax seed chips, seaweed chips and veggie sticks. 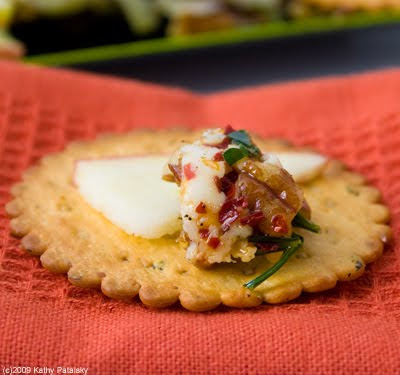 You can even add another drizzle of oil or maple syrup to the cheese before serving. Plate with a cheese or butter knife so that guests (or you) can easily get a nice thin portion of the cheese. *Fiesta Cheese Log: Spicy jalapeno, onion and tomato. Crumbled corn chips. *Fruit Log: Diced apples, grapes and maple syrup. *Veggie Log: Diced bell pepper, carrots, chives and dill. With olive oil. *Greek Log: Olives, thinly sliced grape leaves and crushed walnuts with maple syrup. *Italian Log: Tomatoes, fresh basil, oregano, capers, sauteed mushrooms and olive oil. With balsamic vinegar. *California Log: Crushed almonds, citrus juice, chopped artichoke hearts, sunflower seeds and diced dates. With olive or almond oil. *Miami Log: Chopped mango, lime juice, cayenne and cilantro with Brazil nuts. *Sweet 'n Savory Log: Maple syrup, strawberry jam, olive oil, crushed walnuts, cinnamon, raw sugar sprinkle. *Health 'nut' log: flax seeds, sunflower seeds, crushed raw nuts (mixed), apple cider vinegar, hemp oil, whole fresh blueberries. *Holiday Log: Chopped roasted chestnuts, raw pecans, pomegranate seeds, tangerine juice with olive oil and a thin layer of warmed butternut squash/maple puree on the bottom of the plate. Set cold cheese on top of squash. *New Year Festive-Detox Log: Diced raw fennel, diced apples, lemon zest, chopped parsley, apple cider vinegar, agave, macadamia oil drizzle.